Greta MacRae is our pastor. 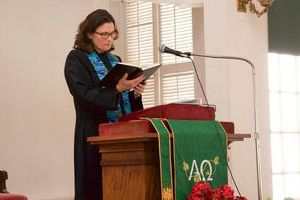 Greta had a midlife call to ministry and she attended Andover Newton Theological School graduating in 2008. At LUCC she loves to teach Bible study and co-teach confirmation and she loves to preach by telling stories that make the sacred story of God come alive. She lives in Plymouth, Ma with two great mutts named Charlie and Maybelle, her cat Grace, and a tank full of fish. Greta no longer has the knees to run but she walks miles everyday, kayaks and does yoga. She loves to read and sing in the car and she still loves dumb jokes.